Any of you that stay up to date with us here at Keefer Inc. are aware that I really enjoy riding the 2019 KX450. Like I really enjoy it. Maybe it is because we have the chassis and suspension dialed in just for me or maybe it’s just because the bike is so damn fun. Either way, I am excited to continue making improvements to this bike in the upcoming months because every time I ride it I feel faster. Next on the chopping block is the motor department and we decided to start with exhaust first. I wanted to test the RS-4 Stainless Steel Yoshimura system because I have had great luck in the past using their systems on other bikes and the guys over there always take great care of us. Although it is a couple years old and mainly showcases road racing disciplines, trust me when I say that it all translates equally into motocross. You can sleep peacefully knowing that your investment is going to be worth it. 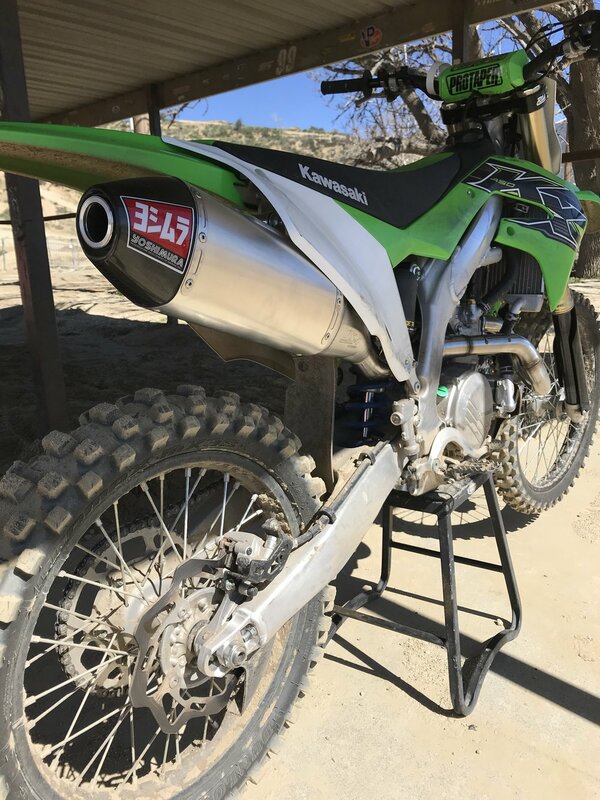 The stock exhaust system on the 2019 KX450 is not too bad overall. Beside it looking really bad (that is a no-contest) and weighing a decent amount, it produces a good tone and useable power. I think this exhaust compliments the motor and power delivery well by keeping things linear and quick revving - one of my favorite traits about this bike overall. But on the flip side, the motor does lack some “meat” in the RPM range and the over-rev tends to sign off relatively quickly at the top. Installation of the new Yosh was quick and easy with every single piece fitting in place perfectly. I love when that happens! The stainless/aluminum system that I tested weighed over a pound less than the stocker and comes in at a fair price of $675.78. In roughly ten minutes, the KX looked better instantly with the new system in place, and when I pushed the button to wake her up, she sounded healthier too. I am not a fan of obnoxiously loud exhaust systems so I was happy to listen to the Yosh when cracking the throttle on the stand. Definitely louder than stock, but not deafening. Before installing the new Yoshimura system, I did a couple morning motos at Glen Helen to get the best gauge of the stock comparison. The most obvious difference when cruising back onto the track was the tone, as it has a deeper/healthier sound. But when in stride, the exhaust made the KX come to life from the mid range and beyond. The linear power curve stayed true on delivery, but exemplified a more crisp powerful feel when on throttle. I felt the Yoshimura system was able to harness a little more “meat” that I have been searching for and also helped push the bike into the higher revs more efficiently. On the top end, over-rev was increased quite a bit as the KX seemed to pull longer and harder overall. I noticed when charging down Mt. Saint Helen I could hold 2nd gear almost half way down the hill before hitting the limiter. The stock exhaust would sign off way earlier than that in the beginning part of the day. I also realized I stayed in 2nd gear almost all the way around the Glen Helen circuit. This is a testament to the linear power I have been talking about on this 2019 KX450, and the Yoshimura system makes it even better. Where I didn’t notice a substantial improvement was bottom end power delivery. The KX is not a torquey bike in stock trim by any means, but I was expecting to get a little more bark with the new system. This was not the case and I found myself clutching the bike in the soft corners to wake it up in order to get back into the mid range, where I think it excels. Overall, the new Yoshimura exhaust system is a great performance improvement to this already great bike. Looks good, sounds good, and runs good - thats what it’s all about, right? Obviously, I am going to set my sights on continuing to improve the power delivery to round out this new KX450. I am happy with the mid/top end feel, so maybe we can experiment with new map settings to get a little more lovin’ down low. As always, stay tuned for what is next here at Keefer Inc. If you have any questions about the 2019 KX450 please feel free to email me at dominic@keeferinctesting.com. Or you can head over to Yoshimura-rd.com to see what they offer for your green machine. The simple fact that more manufacturers are offering off-road closed course competition bike’s brings a smile to my face since at heart I’m an off-road lover. That being said I feel like most manufacturers should know that 99% of all off-road racing organizations require race bikes to be equipped with a spark arrestor. Although the bikes are really good in stock trim, this issue has opened up a nice market for aftermarket exhaust manufacturers to be able to come in and save the day while making bikes race legal. I recently ran into this issue when I decided to race our 2019 Yamaha YZ 450FX at a local District 37 Sprint Enduro and realized last minute that I needed a legal muffler. I made a couple calls, but before I knew it FMF saved the day and I had a slip on Factory 4.1 on its way (two days before heading to the race). When I got the new 4.1 slip on muffler I immediately installed it, which was very self-explanatory and the fit and finish of the stainless can mated to the carbon endcap was top notch. Now here is the part of the story where Kris gave me crap about the spark arrestor… Admittedly I was putting on the muffler last minute and rushing to get all of my stuff ready to race the next day and I did what everyone says not to do; I assumed…. I assumed that the muffler came from FMF with the spark arrestor screen already installed, so I didn’t even think twice before loading up my bike and heading to the race. Well… I soon found out (thanks to my friend Brendon) that I didn’t have a spark arrestor because as Kris warned me about (and I forgot) FMF puts the insert in the bottom of the muffler box, where it stayed in my recycle bin until I got home that night. Luckily I was able to squeak through sound and spark arrestor testing and go to the start line. Initially what I noticed when I fired the 450FX up was that the new muffler was slightly louder (without the screen insert) than the stock muffler. This slightly louder sound was deeper than the somewhat raspy sounding stock muffler. The performance of the stock muffler was by no means hampering the 450FX power character, in fact it was quite good, but like I said, I needed a spark arrestor. The new 4.1 has a larger opening than the stock muffler, which in turn gives the 450FX slightly less back pressure. With a little less back pressure the FX lost a touch of smoothness in the very bottom end, giving the bike a more on/off feel. The tradeoff for the on/off feeling on the other hand was that the bike gained some over-rev and seemed to pull slightly longer into the RPM range. During the race I changed maps to try and smooth out the bottom end which helped, but didn’t completely remedy the bottom end touchiness. After getting home, going into my recycle bin (thankful the trash man didn’t come) and installing the spark arrestor insert, the bottom end delivery smoothed back out. With the insert comes a quieter sound, which was welcomed as well as some added back pressure. The back pressure gives this bike a little more lugability without wanting to flame out, so I didn’t have to worry as much about covering the clutch in tighter sections of the trail. The bottom line is that all bikes marketed to off-road racers should come with spark arrestor inserts, they don’t. That being said, FMF has done a great job at providing the off-road community a multitude of choices for whatever their specific type of riding entails. From full titanium systems, to more affordable aluminum slip on mufflers, FMF seems to have all the bases covered. At $449.99 for the stainless/carbon slip on that I installed, I think it’s a good combination of not breaking the bank while still looking slick at the track (not to mention that it takes almost two full pounds off your bike). If you have any questions, or just want to tell me I’m a dumbass for not seeing the spark arrestor in the box, feel free to reach out to me at Michael@keeferinctesting.com . It’s no secret that the Honda CRF250R is still lacking some bottom to mid range power when compared to the other competitors in the 250 class in 2019. Seeing as how I’ve been logging some hours on this machine as of late, I decided to test the full Yoshimura RS-9T titanium system to see if we can get some added low end power. Installing the new full system took me less than 20 minutes and the instructions were very detailed. All of the parts that came inside the box fit perfectly and no curse words were thrown out in the garage while installing the Yoshimura exhaust. Now to the part that everyone wants to know. Does the Yoshimura help the 2019 CRF250R? The simple answer is yes, but who likes simple answers? Not me! With the stock system, the Honda pulls nicely from mid top end, but when exiting corners and trying to grunt up obstacles, the engine needed some assistance. The best way I can explain the stock feeling 2019 CRF250R is that it needs help on “recovery" when the rider makes a mistake. “Recovery” basically means how long it takes the engine to recover by getting in the meat of the power again. When you're tired or lazy and miss a shift, this is where the Honda CRF250R gets smoked by the Yamaha YZ250F. I had to ride a gear lower at times in corners (with the stock CRF250R compared to other 2019 250F machines) and if I didn’t, it took a bit of clutch feathering and more coaxing to get the bike pulling hard again. If the track is flowy and fast the stock Honda works great, but when the track is tighter, this engine suffers. As soon as I fired the bike up with the new exhaust it was clearly a bit louder, not obnoxious, but a nice throaty sound that was deeper. I tested the stock system back to back with the Yoshimura system on consecutive days, so it was interesting to see the places (at each track) where the bike really felt different. The most noticeable place the bike felt better was out of tight inside ruts that exited up jump faces. With the stock system I had to slightly slip the clutch all the way up the lip (to be able to clear the jump). When I bolted on the Yoshimura system I could leave it in second gear and just use the meat of the newfound bottom end power to pull me up and over those types of jumps. When I had to be in second gear and scream the bike (with the stock system), I could now be in third gear and use the smoother/stronger part of the power to exit the turn with the Yoshimura muffler system. RPM response was improved as well and this made the Honda feel even lighter when popping out of corners. Connectivity to the rear wheel was improved and even with that extra RPM response I gained with the Yosh system, I received more rear wheel traction. From mid to top end I only noticed a sightly better pulling power down each straight with slightly more over-rev. This part of the muffler wasn't mind blowing, but took me a couple tracks to figure out that there was a little extra “meat” through the mid range (compared to stock). Overall the little Honda just has a little more RPM response, better pulling power through second and third gears, and a small gain when revving the bike out in each gear. This doesn't mean that your new Honda CRF250R (with the Yoshimura exhaust) is going to be a YZ250F killer, but it closes the gap a little. If you have a 2019 Honda CRF250R and feel like you’d like a bit more bottom-mid range power I’d definitely look into the RS-9T system. There are three types of Yoshimura mufflers that you can choose from; a slip on muffler system ($763.15), the full stainless system ($947.36), and the full titanium system ($1463.15). Admittedly none of these are super inexpensive options, but it’s one of the few things in today’s four-stroke world that provides a true bolt on benefit. Besides, if you were looking to save a few bucks, I don't think you would be rocking a new 2019 Honda CRF250R right now anyway. The 2019 Yamaha YZ450F won the Keefer Inc. Testing shootout this year because it has all tangibles that are needed to let a rider go fast on the track with the least amount of work. I am a fan of the stock muffler system on the 2019 YZ450F, but was looking for a full system to help me lose some weight and gain a little more mid range pulling power without sacrificing low end delivery, that the stock system does so well. I went to Pro Circuit to seek out Mitch Payton and see if he would give me a Ti-6 Pro Titanium System to try out. I managed to walk out with a system, but missed out on the opportunity to speak with Mitch. He probably doesn't even know who the hell I am, but I appreciate that he got me a system to test out. I haven't tested that much Pro Circuit products in 2018, but our next couple project builds will have some PC products on board or 2019. The Pro Circuit Ti-6 Pro full system was created for professional racers competing in a series such as AMA Supercross or AMA Motocross to ensure they pass AMA/FIM sound regulations. The Ti-6 Pro Titanium Exhaust System is constructed of titanium throughout the head pipe, mid pipe, and canister while the end-cap is carbon fiber. I wanted the “Pro” system because I have learned that loud mufflers are not the best mufflers for power feeling on the track and sometimes putting an insert in “some” mufflers actually helps power delivery. Installation of the PC system was painless to install (for Yamaha standards), but always make sure to install the headpipe on the cylinder head studs and then connect the mid pipe. Once the mid pipe is slipped onto the headpipe you can begin to tighten the headpipe nuts. This assures that the mid pipe doesn't bind and is free. So how does this sucker feel out on the track? The exhaust note on the Pro Circuit Ti-6 Pro is not near as loud or weird sounding as the Ti-6 or T6. The exhaust note on the “Pro” is deeper and slightly quieter, which I personally like more. The power delivery is slightly smoother down low, but only on throttle opening. At 0-5% throttle position there is a slightly softer RPM response, which I didn't mind on nasty, dry, choppy tracks in Southern California. If I needed more bottom I simply ran a more aggressive map and that helped the “pop” I was looking for out of corners. I usually ran the TP 2.0 map with the Pro Circuit system and it made me happy with the amount of smooth roll on power I had. The rear wheel definitely feels connected to my throttle hand and in comparison the PC system has more bottom end power than that of the Akrapovic that I tested a couple months ago. The mid-range is where I wanted more power out of the Yamaha and this is where exactly the PC system delivers. The meat of the Ti-6 Pro’s power out of corners and accelerating down the next straight is much better than stock. I am able to use second and third gears longer with the PC system (compared to stock) and even though the low RPM response is slightly softer than the stock system, the mid-range RPM response is much more instant. Mid- range RPM response is crisp and makes the Yamaha feel “lighter” when trying to hop over square edge choppy areas of the track when accelerating. Top end pulling power is as good as stock as the PC Ti-6 Pro doesn’t pull harder up top, but the PC system does have slightly more over-rev. I am able to be slightly lazier with my shifting and can decide to shift later after each corner. I was impressed how the Pro Circuit Ti-6 Pro delivered and spread out its power and to me made the Yamaha even more fun to ride. If that is possible? The PC Ti-6 Pro Titanium System runs $1,064.95 and is available over at procircuit.com. I will be doing a 2019 Yamaha YZ450F Muffler Shootout Podcast in the very near future, so if you want to hear how it stacks up against its competitors listen and subscribe to the Rocky Mountain ATV/MC Keefer Tested Podcast right now. If you have any questions about this test please feel free to email me at kris@keeferinctesting.com. If there is one 2019 450 motocross machine that I think has the fastest overall engine character, it would have to be the Honda CRF450R. This engine is basically a race engine out of the crate. If you want to get to point A to point B in a quick manner, this Honda is the engine for you. So why on earth would you need more power? To me you wouldn’t need MORE, but maybe you can massage that power and move it around so that the engine delivery is slightly more controllable. This is where the KTM and Yamaha engines are better than the red machine. Both have more controlled power when the track gets rough or slippery. Controlled power is crucial in today’s 450cc world and a good muffler system can give you exactly this, if it’s a good system. Key word here people is “IF” it’s a good system. It is not as simple as reading dyno charts and slapping it on your bike. It requires real world track testing to feel the power character as well. We wanted to install/test a muffler system on our 2019 Honda CRF450R (that we purchased ourselves) to see if we could improve on a power plant that was already pretty damn impressive. We chose the Yoshimura RS-9 full titanium muffler system to try back to back with the stock system to see if it was in fact, what we were looking for. When we originally tested the 2017-2018 CRF450R Yoshimura RS-9 system, we thought it was a pretty damn good system that was better than stock. However, the 2019 CRF450R stock exhaust changed for the better, so Yoshimura went to work on a new headpipe design to try and achieve even more power (than the stock 2019 exhaust system). Yoshimura also wanted to tuck in the new headpipe design, so it was less susceptible to crashes. Once installed and on the track the Honda’s exhaust note turned from the high pitch semi raspy stock sound to a deep throaty, more traditional 450 factory race bike sound. The crack of the throttle (or RPM response) is slightly smoother and less crisp than that of the stock system, but bottom end pulling power is increased over stock. Rolling out of corners, in second or third gear lets the rear wheel find increased traction over stock and was more controllable while accelerating out of hard pack corners. The slightly smoother RPM response takes away the Honda’s exciting feel slightly, but helps you gain a little more control coming out of corners. This is what I was looking for in a Honda CRF450R muffler! The mid range pull is healthier, with more meat, than stock and while the stock system had a tough time pulling third gear in tight/slower corners (without a gearing change), the Yoshimura system will give you an easier time rolling third gear in those tighter corners. With just the flick of the clutch lever (in third gear) the Honda will be in the meat of the power once again and have you down the straight in a hurry. We noticed top end and over-rev was better than stock, as the Yoshimura system helps the Honda carry second and third gears longer. It pulls amazingly well on deeply tilled dirt in second and third gear and there wasn’t a time where I thought to myself “I need more top end pulling power”. You could tell Yoshimura was focused on controlling, yet increasing, the bottom to mid-range pulling power when they designed this 2019 CRF450R muffler system and they succeeded in doing so. It’s also impressive that they didn’t lose any top end and over-rev in the process, in fact they got some extra! Craftsmanship is second to none with the Yoshimura RS-9 titanium mufflers. After weighing both the stock and Yoshimura RS-9T systems you will be saving almost two full pounds, which is great since the Honda is on the heavier side (on paper) for a 450cc motocross motorcycle. This is a significant weight loss but for $1,499.00 it is a very pricey bolt on modification. If you are looking to save a little money, Yoshimura offers the stainless steel/carbon version for $980.00, but you will not be saving much weight (only half a pound). Again you can’t say enough about the craftsmanship that goes into a Yoshimura system. The welds are flawless and the mufflers tuck up inside the side number plates for a stealthy, compact look. If you’re looking for a little added pulling power, with more control/connection on the track, and not to mention sexiness out your new 2019 Honda CRF450R, the Yoshimura RS-9T system will help you do all of those things very well. You will have to decide if you want to dip into your checking account to pay for these added features, but if you're in the market for a 2019 Honda CRF450R muffler, there is not a better system out there for this model. The Yoshimura system has held up great over my years of testing them and you can even send your system back for Yoshimura to re-furbish if you choose (for a fee of course). You can head over to Yoshimura-rd.com to get yours or call them at 800-634-9166. The 2019 Kawasaki KX450 is the most improved machine of the new year, hands down! It has a very responsive engine character, comfortable suspension, a lightweight feel and cornering that is very neutral. I will be the first one to admit that I get nervous about sticking on any type of aftermarket muffler system when I really like the stock power curve of any machine. Sometimes aftermarket mufflers are just smoke and mirrors. They are lighter, titanium, look cool, but in the end they are no better than your heavy, ugly, big stock muffler. While I was testing the 2019 KX 450 earlier this year I could hear this little voice inside my head say “it’s going to be tough to make a muffler that is better than this stock one”. Fast forward to a few weeks ago and a shiny new FMF 4.1 RCT titanium exhaust shows up at my door, to be evaluated on the green machine. I sat on it for a week knowing that this new, shiny, lightweight piece of FMF artwork might not be better than the current monstrosity that is on the 2019 KX450. Nonetheless I installed the FMF system (which was easy I may add) and headed to the track to give it a go. The stock power curve of the 2019 KX450 engine has a snappy throttle response (with a free feel to it) and at times can almost be too much through corners with the standard green coupler installed. Once rolling on the throttle and passed the corner, the power is not quite as strong as the Honda or Yamaha, but still creates a easy to ride power feel on the track. I didn't necessarily need more rpm response with the 2019 KX450, but I wouldn’t mind some more meat through the mid to top end range. Bolting on the KX450 FMF Factory 4.1 RCT system is by far the easiest system I have installed on any 2019 machine. Installation literally took me through two full songs on the “Classic Rock” station on Pandora. Not bad! The 2019 Kawasaki is a light bike stock, but FMF sent me the full titanium system, which dropped the Kawasaki’s weight by 2.9 pounds from the stock system! To me the titanium FMF 4.1 system is one of the most stunning aftermarket mufflers you can put on any bike. I love the blue anodized finish as it looks good on almost every make and model machine there is. FMF builds great looking mufflers! On the track the FMF 4.1 makes a slightly smoother bottom end power delivery, but keeps that exciting RPM response. Where most of you will feel your hard earned money is in the mid range pulling power when exiting corners. The stock system feels empty in this area, but the FMF fills in the power through the mid-range. What I mean by “fill in the power” is that the FMF system actually feels like it is shooting forward, as soon as you shift into third gear, unlike the stock Kawasaki’s power where it lacks some “meat” through the mid-range. The FMF 4.1 increases that mid range area and gives the rider some more freedom to be lazier in third gear. That is great news for all you vet riders out there, trust me! Top end is also increased slightly and you get increased pulling power near the end of each straight with the FMF. Over-rev is slightly increased as well with the 4.1 (over the stock muffler) as I could leave the KX450 in second and third gear slightly longer. The one downside to me is that it is loud sounding (compared to the stock system). It has more of a deeper/throatier pitch to it, which makes it sound louder than the stocker. I tested couplers along with mapping with the Kawasaki R&D guys and came up with a couple options for you (see attached maps). The white coupler map is better for bottom-mid range power, but the black coupler map is slightly better from mid to top end (the black coupler map is what I am running now). The good news is, unlike last year, the 2019 KX450 FMF 4.1 system will not have that de-cel popping with either coupler (along with these installed maps), which is a huge plus when it comes to a clean ignition/fuel mapping power feel. At the end of the day the FMF 4.1 RCT full titanium muffler system delivers a smoother roll on bottom end delivery with a mid to top end puling powerl that is better than stock (along with improved mid-top end RPM response). I will say this again….Being able to achieve a power delivery that is better than what an OEM muffler system can give you is very hard to do. FMF has achieved this with their 4.1 system on the 2019 KX450. Not only does it make power, but it also takes off some weight and looks better than the stock bazooka. I wanted some added control down low and more mid range (on the 2019 KX450) so with this FMF system I got what I was looking for. I am not going to sit here and tell you guys that every FMF system, for every machine is better than stock, but with this one they knocked it out of the park. Don't be scared to try the maps that are attached above, because with today's four-stroke technology, getting the correct mapping for a certain muffler can really make a difference. Attention mechanically inclined riders!!!!! Please note that re-packing of the FMF muffler is important for the can’s lifespan. The muffler portion (or can) will start to leave hot spots/scarring when the packing starts to burn away from inside. Once you start seeing these “hot spot/scars/markings” on the muffler, remove and re-pack it ASAP. FMF offers re-packing kits and taking the can apart to re-pack is not that hard to do. I get around 12 hard engine hours before I see these markings and have to re-pack. If you run it past the recommended time, you run the chance of hurting performance and damaging the core (or perf) inside the muffler. Don’t be a dummy and waste your money, re-pack your muff! You’ve heard me talk a lot about how stock muffler systems are pretty damn good right? Usually I say something like, “the stock 2018 Yamaha YZ450F muffler system is hard to beat”, but that quote doesn't stop me from trying to see if there is something better out there. I am a fan of MXGP’s and seeing the Akrapovic mufflers on the Yamaha’s of Romain Febvre and Jeremy Van Horebeek got me thinking I wanted to try one of these beautiful looking systems. After some scouring, I found a US connection and got one delivered to give it a test ride. First off the Akrapovic Evolution muffler system is one of the most beautiful looking systems made today, is well built and has quality welds all the way around it. Once hot, the titanium color of the headpipe is the most dynamic blue you will ever see from any muffler manufacturer. The Akrapovic Evolution titanium muffler system is 1.5 pounds lighter than the stock system and tucks under the right side panel very nicely. When putting on the system make sure to leave the headpipe loose and then connect the mid pipe, so that the slip fit joint slides in easily. Once those two pieces are connected, tighten the headpipe bolts and mid pipe bolt just snug. The Akrapovic uses your existing stock heat shields or you can purchase carbon heat shields separately. The Akrapovic muffler uses an aluminum spacer in the rear hole to give the muffler enough clearance (from the brake caliper) once the suspension is full collapsed. I did notice that there is a small screen deep inside the core of the muffler, however I was told that this isn't a spark arrestor, but a noise insert. Note: Leave the insert in, as the muffler performs better with insert in and is much pleasant to the ear. Once rear section (muffler) was installed, I went around and tightened up the remaining bolts. Doing it this way ensures there is absolutely no binding going on between each slip fit joint. Out on the track the Akrapovic Evolution muffler has a deeper sound and is slightly quieter than the stock system. I started the test with the “TP map” installed inside the 2018 YZ450F (if you don’t know what the TP map is, email me at kris@keeferinctesting.com). Roll on power delivery was smoother out of corners with the Akrapovic and “TP 1.0 map” installed compared to the stock system and “TP 1.0 map”. I didn’t really like the smoother delivery and I wanted to get some bottom end delivery back, so I went to the TP 2.0 map. Doing this helped me get some of the RPM response and bottom pull that I wanted back from the Yamaha out of corners. If you feel like you want a smoother delivery or ride hard pack you may want to leave the “TP map 1.0” installed with the Akrapovic. The Akrapovic system really comes alive once out of the corner as the Yamaha starts pulling harder and longer than the stock system down straights. Second and third gears can be stretched longer by the rider and once the TP 2.0 map is installed back in the bike (with the Akrapovic) rolling third gear in corners is slightly easier on the rider as well (with 49 tooth rear sprocket). Over-rev is slightly better through each gear with the Akrapovic and the overall engine feels like it revs a little quicker. The Akrapovic also gave the Yamaha YZ450F a free-er feel and takes away a little engine braking sensation on de-cel. In conclusion, I feel the Akrapovic Evolution muffler system is an excellent system once going back to the TP 2.0 Yamaha Power Tuner setting. You will not be getting more bottom end than a stock system, but the gains through the mid-top end are a noticeable difference. It will be up to you if that difference is worth the $1300.00 you will spend on the Evolution titanium system. Akropvic’s website is a very informative, clean, and one of the best aftermarket muffler websites to browse around on if you got the time. There are dyno charts, a sound tool that lets you compare the stock system to Akrapovic’s muffler sound, documents of replaceable parts, and technical data about the system itself. You can head over to akrapovic.com and punch in what bike you want to geek out on. I did, for about an hour! The Akrapovic accepts the use of Yamaha's stock heat shields. If you have kept up on my social media channels (@kkeefer120, @keeferinctesting) you will know that I have been riding the crap out of the 2018.5 Husqvarna FC450 Rockstar Edition and 2018.5 KTM 450 SX-F Factory Edition machines. I enjoy riding these two machines because they are easy to ride, well balanced and feel extremely lightweight when cornering. I do however wish they had some more RPM response and low-end excitement. Since the new Husqvarna RE’s and KTM FE’s are not coming with an aftermarket muffler this year I wanted to get my hands on FMF’s version as soon as possible to give you all some feedback, just in case you wanted to add some more bling and possible horsepower to your new machines. The new FMF 4.1 RCT Full Titanium Muffler System that you see here will fit on either your 2018.5 KTM Factory Edition or your Husqvarna Rockstar Edition. The FMF 4.1 system went on easy on both bikes and took only a few minutes to install. Thank you to Husqvarna and KTM for making the new bike much easier to change a muffler. Gone are the days of dropping the shock and cursing in the garage just so you could get your new muffler system on. I tested the FMF 4.1 muffler system at several tracks on both bikes and had similar results at each track I tested at. In stock form the KTM Factory Edition has a little more throttle response and bottom end pull than the Husqvarna Rockstar Edition, but the RE pulls slightly longer up top. With the FMF system installed you will not be getting increased bottom end pull on either machine (compared to stock), but you will be getting a little more bottom and mid-range RPM response (or throttle crack for you not testing type readers). I noticed the added RPM response more on the Husqvarna, especially on low RPM, out of corners. The FMF system makes each machine’s engine character slightly more free-feeling and exciting. I also appreciate that I am not getting any added de-cel popping (or lean sensation) with the FMF system and both bikes ran just as clean with the FMF system on than it did with the stock muffler. Where you will notice the most improvement with the FMF system is through the mid-range. The mid-range “meat” you will get out of the FMF 4.1 system is downright impressive. Rolling the throttle on out of corners and accelerating you will notice an increased pulling power that wasn't there with the stock muffler on either machine. Whether you're coming out of a corner in second or third gear you will notice some extra horsepower getting to the next obstacle. With the added mid-range meat of the FMF system it really helped some of the gearing issues I had at tighter, less flowy tracks I tested at. Gaining some mid-range let me use third gear in some corners that was tough for me to decipher which gear was better. With the stock system I would roll into these corners in second gear and have the right amount of "pop" to get me out quick, but I had to shift early once exited, to keep the rear wheel from spinning. Third gear was too tall of a gear to get me out of the corner quick, but provided less wheel spin on the exit, so it was always a struggle for me to decide on which gear to use when being pressured from behind by another rider. With the FMF installed I could easily use third gear and have enough "pop" to get me out of the corner in a hurry, yet it kept the wheel spin to a minimum by being able to use a taller gear. So basically what I am saying is that FMF’s 4.1 system made me think less and twist the throttle harder, something I like doing. I didn't get any more top-end with the FMF installed, yet it didn't take any away from either machine. I did notice slightly less over-rev with the FMF system (from stock) when I got lazy and tried to wring each machine’s neck out in second and third gear. I don't mind not gaining anymore top- end and losing a touch of over-rev with these two models, because they are one of the most powerful engines in these ranges. I am not looking to own a top fuel dragster here. You have heard me say it time and time again that it's tough to beat a stock muffler system these days. You see more and more after market companies taking the time to release their new model systems because it’s not that simple to make a muffler system better than stock. FMF made their new 4.1 RCT titanium muffler with Mega Bomb Plus headpipe not only better through the mid-range, but a full pound lighter on the scales as well. If you just purchased your $10,000 plus Husqvarna RE or KTM FE and still have $1099.99 burning a hole in your pocket, I approve of this new system Lil D and the boys over at FMF developed. Head over to fmfracing.com or give them a call at (310) 631-4363 to see when this system will be available. It’s no secret that the all-new 2018 Honda CRF250R is lacking some bottom to mid power when compared to the other competitors in the 250 class. Seeing as how I’ve been logging a lot of hours on the machine as of late, I was designated to be the main test rider for the full RS-9T stainless system. Installing the new full system took me less than 20 minutes and the instructions were very detailed. All of the parts that came inside the box fit perfectly and no swear words were thrown while installing the Yoshimura exhaust.. In my opinion, Yoshimura is one of, if not the highest quality exhaust manufacturer in the industry. In my full time job I work in an R&D department of a welding shop and I can tell you first hand that the quality, fit and finish of a Yoshimura exhaust is impressive. Now to the part that everyone wants to know... Does the Yoshimura help the little red screamer? The simple answer is yes, but who likes simple answers? Not us! With the stock system, the Honda pulled nicely from mid-range to the super high rev limiter, but when exiting corners and trying to grunt up obstacles, the engine needed some help. The best way to explain the stock feeling CRF250R is that it’s similar to a 125 two-stroke. By saying that I don’t mean it’s as slow as one, but I felt like I had to shift my riding style from four-stroke to two-stroke mode. I had to ride a gear lower at times in corners (than other 250F machines), and if I didn’t, it took a bit of clutch feathering and more shifting to get the bike pulling hard again. The 2018 Honda CRF450R is a refined version of the 2017, albeit a better one I may add. If you listened to the muffler shootout podcast you would know that this is a great muffler to add to your new Honda CR450R. If you haven't listened do yourself a favor and click on the podcast tab and look for the "Honda CRF450R Muffler Shootout Podcast". Once I got my hands on one and I took it through the ringer of the shootout process, I knew Yosh had put some R&D time into this system. We know Yoshimura works closely with the Factory Honda team here in the states and have seen the RS-9T muffler on Cole Seely and Ken Roczen’s new bikes so it's no surprise that they work pretty damn well. The Yoshimura RS-9T system only comes in a dual can set up (no single mufflers are available from Yoshimura) and is a three-piece slip fit design. Installation of the system was painless and took 15 minutes to install, which was nice to do when at the track swapping mufflers. Once installed and on the track the Honda’s exhaust note turned from high pitch 250F’esq to a deep throaty more traditional 450 factory race bike sound. The crack of the throttle (or RPM response) is slightly smoother and less crisp, but bottom end pulling power is increased over the stock muffler. Rolling out of corners, in second gear, feels like the rear wheel has even more traction than stock and was more controllable while accelerating out of hard pack corners. The slightly smoother RPM response takes away the Honda’s excitement feel ever so slightly, but helps you gain a little more control coming out of corners. The mid range pull is healthier than stock and while the stock system had a tough time pulling third gear in tighter corners (without a gearing change), the Yoshimura system will give you an easier time rolling third gear corners. With just the flick of the clutch lever (in third gear) the Honda will be in the meat of the power once again and have you down the straight in a hurry. We noticed top end and over-rev was as good as stock (which is great). It pulls adequately down the straights in second and third gear and there wasn’t a time where I thought to myself “I need more top end pulling power”. Ehhhhhh. No. You could tell Yoshimura was focused on bottom to mid-range pulling power when they designed this muffler system and they succeeded in doing so. It is also impressive that they didn’t lose any top end and over-rev in the process. After weighing both the stock and Yoshimura RS-9T systems you will be saving 1.9 pounds, which is a nice chunk off of a already heavy (on paper) motorcycle. This is a significant weight loss but for $1,499.00 it is a very pricey bolt on modification. If you are looking to save a little money Yoshimura offers the stainless steel/carbon version for $977.00, but you will not be saving much weight (only half a pound). I really like the craftsmanship that went into the Yoshimura system. The welds are flawless and the mufflers tuck up inside the side number plates for a stealthy, compact look. If you’re looking for al little added giddy up and bling from your new 2018 CRF450R, the Yoshimura RS-9T system will help you on the track, but your wallet will be not as fat. This is the price we pay for getting some extra HP and a better-looking muffler right? This is one of my favorite systems for the 2018 Honda CRF450R and it has held up great over time (over 20 engine hours). You can head over to Yoshimura-rd.com to get yours or call them at 800-634-9166. Before I start this review I am going to go on a little rant here, so bare with me. Mufflers are always a hot topic when it comes to horsepower, especially when you get a new bike. I know a lot of riders out there get a muffler system before they even ride their new bikes! Ride your new bike and break it in before purchasing any muffler please! See what you're working with and purchasing, so you know if its better than stock. Because if it’s not better than stock, what is the reason you purchased it in the first place? To look cool. To drop some weight. Those two statements would be the only answers that are acceptable when someone asks you why you have a new muffler on that bike that has an hour meter that reads 0.1 hours. Ok moving on…….. When it comes to Yamaha motorcycles, Doug Dubach is a name that comes to mind immediately right? Doug has been a Yamaha test rider for 87 years and is almost that old, but don't tell him I said that. Seriously, Doug knows the ins and outs of the 2018 YZ450F like the back of his hand, so I was anxious to try his slip-on muffler when I reached out to him. However, instead of trying a full system I wanted to do something different and just try a slip on muffler system. A slip on system is only the rear section that keeps the stock headpipe and mid-pipe intact. I installed the DR.D stainless muffler system (that saves just over one pound compared to stock) in only 3.5 minutes. I am very picky when it comes to mufflers and how they deliver the power to each bike I evaluate. The DR.D slip on keeps the stock feeling YZ450F bottom end pull intact, but maybe softens the low end RPM response just a tad. This is only noticeable on super loamy style tracks, but helped rear end traction feeling on hard pack style tracks. Losing a little RPM response and gaining some rear wheel traction is not a bad thing on this beast of an engine. I want to note how hard it is to build a muffler system that keeps the low end pulling power feeling of a stock 2018 YZ450F as I have tested several full muffler systems that had less bottom-end than stock. Where most of you will feel the difference between the stock muffler and the DR.D is mid range pulling power. The mid-range meat that the DR.D system delivers is impressive and gives you a better pull in second gear and helps the third gear transition when shifting. With the stock Yamaha system (with stock gearing) it was hard at times to carry third gear through corners, so shifting to third immediately after the corner was a must. With the DR.D system I have the freedom to leave the Yamaha in second through the corner and shift early without the blue machine falling off the power much. Or if you choose to run third gear in corners it picks up the power slightly earlier and helps lazier/lug heavy riders get out of the corner quicker with more rear wheel traction. Top end is also slightly increased over the stock muffler as you are able to hold each gear (well, to be honest the only gears I used was first through fourth) slightly longer. If you're looking for more over-rev this isn't the muffler you are looking for because the DR.D system keeps all of the stock feeling over-rev on the track and doesn't gain anything extra. This isn't a bad thing as the standard YZ450F power character revs out just fine. The DR.D slip on stainless system is the best slip on system that I have tried on the 2018 Yamaha YZ450F and will only set you back $395.00. Not to mention that you’re not losing any horsepower and gaining some mid-top end, while getting some added rear wheel traction. The DR.D muffler system comes with quality packing, has a nice sound to it without it being obnoxiously loud, is easy to re-pack on your own and doesn't blow out quickly. If it comes time to re-pack and you don't want to do it yourself, Dubach has an exhaust packing service where you can send in your muffler and he will re-furbish it for you for a small fee. If you're wife is having a conniption fit about you spending more money on your new bike you can tell her you're saving around $600.00 by not going to a full system. You’re actually compromising and doing her a favor! You're welcome fellas! You can check out all of the mufflers that DR.D makes over at dubachracing.com. It’s hard sometimes to get more power out of newer four-stroke models nowadays with aftermarket mufflers systems. To be honest with you most stock systems are pretty damn good and aftermarket muffler companies like FMF work really hard to try and give you that little extra bit out of a system. I can sit here and tell you that FMF is one company (of only a couple in existence) that will take the time to listen to the proper feedback (either from me or other media testing outlets) and make the necessary changes to alter a new four-stroke machines power in the right direction. The key word here is “alter” and maybe not “gain”. 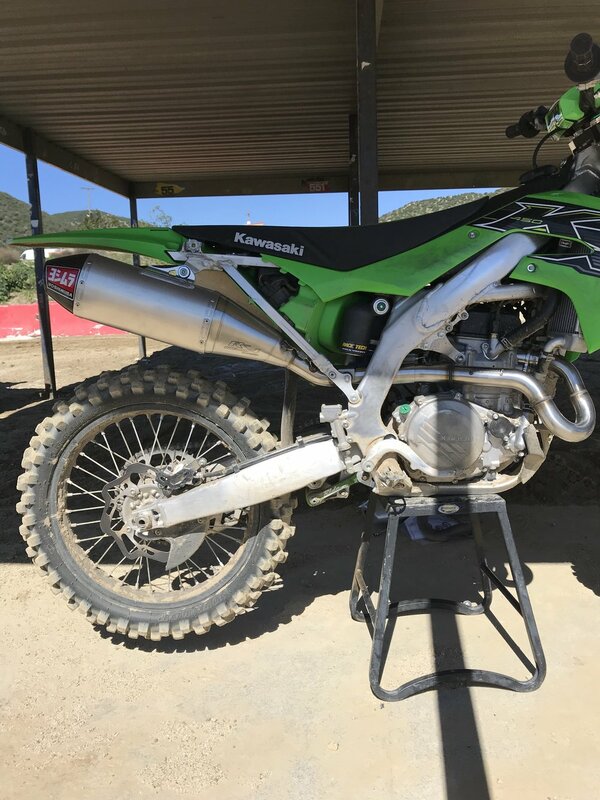 Yes, in this article you will hear me talk about “gaining” a little pulling power, but to me the configuration of the 2018 Kawasaki KX450F FMF 4.1 RCT Muffler System power delivery is more “altered” from stock than anything. The stock power of the Kawasaki is unchanged for 2018, but that doesn't mean it’s not a great bike. The engine has a snappy throttle response with a free feeling, on de-cel, without much engine braking. Once rolling on the throttle, the power is not as strong as the Honda or Yamaha, but still creates a lightweight feeling on the track. I didn't necessarily need more rpm response with the KX450F, but would like more meat through the mid to top end range. Bolting on the KX450F FMF Factory 4.1 system is bar far the easiest system I have bolted on for 2018. It took me literally two full songs on the Metallica Pandora station to change the muffler. The Kawasaki is a light bike stock, but I chose to go with the full titanium system that let me drop 1.8 pounds from the stock system! Visually the titanium FMF system is one of the most stunning aftermarket mufflers you can put on a bike. I love the blue anodized finish as it looks good on almost every make and model machine. On the track the FMF 4.1 on the KX450F makes as much bottom end power delivery as stock and keeps that peppy/exciting RPM response. Where the FMF 4.1 system really impressed me was mid range pulling power when exiting corners. The stock system feels empty in this area, but the FMF fills the power-feeling in through the mid-range. What I mean by “fill the power in” is that the FMF system actually feels like it pulls as soon as you shift into third gear unlike the Kawasaki’s power where it feels like it lacks some pull through the mid-range. There is a dip in the Kawasaki’s mid to top end power and the FMF brings back some meat through that area, which in this case “fills in” that area. Top end is also increased slightly and you get increased pulling power near the end of each straight with the FMF. I did go back and forth with the couplers on the KX450F and came to the conclusion that although the lean coupler is better for bottom-mid range power, the standard coupler is slightly better from mid to top end. I will have to say when you do go to the lean coupler that the KX450F will pop more on de-cel with the FMF system than the stock muffler. With the standard coupler de-cel pop is minimal and not as noticeable with either system. Bonus: If you listen to my Keefer Tested podcast you know that I rate some parts and motorcycles by a numeral system. I wanted to break down the FMF system to the stock system for you all below. If you don’t know what these numbers mean, please go listen to show #3 “How To Test” and you will understand better what these numbers mean. I have ridden with Yoshimura and stock systems on the 2017 CRF450R the most recently. I have a good feeling of both of these systems, so breaking down the FMF system was fairly easy to dissect on the track. The FMF 4.1 muffler system has incredible amounts of bottom end and throttle response. The bottom end comes on strong and the Honda keeps its exciting, crispRPM response feeling, but lets you run third gear through corners a little more than the stock or Yoshimura muffler systems can. Downshifting to second almost makes the Honda a little too much too handle with the FMF system installed (on roll on) through some corners. When going to the FMF 4.1 system I reverted back to map 1 (standard map) instead of map 3 (aggressive map). Since the FMF has so much bottom end I could use the standard map instead of having to use map 3 like I do on other systems. Mid range is broader and pulls farther than the stock muffler, so using third gear is almost the perfect gear for most tracks (with stock gearing). Through mid to top end the FMF system almost mimics the Yosh in pulling power feeling on the track. Over-rev isn't increased dramatically over stock, but I did notice that you didn't need to rev the Honda with system as shifting early was a welcomed attribute to the American made muffler. I did notice that the FMF system is louder than the Yoshimura and stock systems, but keeps a race oriented deeper sound. It takes you a little while to get accustomed to the sound once on the track, but the good news is that the muffler packing has lasted past the 12 hour mark and hasn't changed much to the ear. I used to get only 8-10 hours on other FMF muffler systems, but the dual Honda system has proved to be more durable. the system is light at 8.3 pounds and will remove a couple pounds off of your stock system. In my opinion this is one of the best mufflers that I have tried for the 2017 Honda CRF450R. Yes, it is louder sounding than others, but the increase in power feeling on the track makes it hard to beat. If you're looking for an exciting feeling muffler system that performs as good as it looks the FMF Titanium Factory 4.1 RCT Muffler System is a good buy. At $1299.99 it is slightly less money than its competitors and for as long as we all waited for Don and the fellas at FMF to get it out there, it is well worth the wait. You can go to www.fmfracing.com to order yours. Have any questions about this test? Feel free to hit me up at kris@keeferinctesting.com and I will do my best to answer any reasonable questions for you.